On paper, Wrestlemania 31 did not seem like it was going to be exciting. Even though the line-up included Brock Lesnar, The Undertaker, Sting, Triple H, Ladders, Battle Royals and yes, even a Big Show… the feeling prior to Wrestlemania was lackluster. In contrast, the excitement for the Friday show that the Event Center in San Jose State University was palpable. All it took was 3 letters: N-X-T.
5,000 people sold that the venue in less than an hour. That was repeated through the night. Well, that 5,000 might as well be the 76,000 thousand at Wrestlemania because that was how much energy was flowing through the crowd. Corey Graves came out to introduce NXT to the crowd but he was speaking to the converted. We knew that the developmental promotion, the future of wrestling, were more than capable of being wrestling’s present. So the time for talking was over; after Jim Ross – who had a front row seat – got up and waved his hat, ushering the crowd to calm down long enough to Graves to finish his speech, it was time to get to the fighting. Tyler Breeze versus Hideo Itami was the right way to kick off the show. 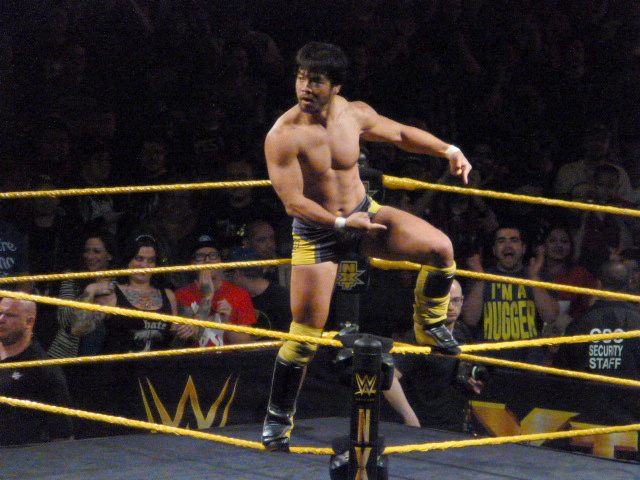 The crowd was at a fever pitch for Itami, who had just qualified for the Andre the Giant Memorial Battle Royal. And his ongoing battles with Breeze are must watch on the WWE Network. The crowd could not stop chanting “Hi-de-o” or “Breeze is Gorgeous” throughout. And the moment we all wanted to see happened. After a hard fought exchange, Hideo Itami called for the GTS, the move that he invented. And he’s teased it before, on NXT and NXT: Takeovers, bringing the Full Sail crowd to new levels of euphoria. But, 0n this night in San Jose, Itami’s knee stuck the face of Prince Pretty and the SJSU Center erupted! And that was just the first match! The crowd didn’t die down after that (okay, maybe for Bull Dempsey versus Jason Jordan but, how do you follow the first ever GTS by Itami? ); that love was for every NXT Superstar. Like hometown girl Bayley who led her partner Alexa Bliss to victory over Becky Lynch and newcomer Dana Brooke. Or Baron Corbin, the Superstar everyone loved to boo for some reason. Baron just channeled that frustration towards his opponent, Rhyno. These two wailed on each other until Corbin hit the End of Days to get the victory. but the fight was far from over. The War Machine recovered long enough to deliver a Gore! Gore! Gore! that leveled Baron, much to the delight of the crowd. Rhyno is an example of the fountain of youth that is NXT. It can re-invigorate the careers of seasoned performers like Rhyno, going toe to toe with the future stars. Triple H is another example. Triple H is the mastermind behind NXT. And, on Wrestlemania weekend, he got a standing ovation from 5,000 fans that felt like 50,000 fans, if not more. 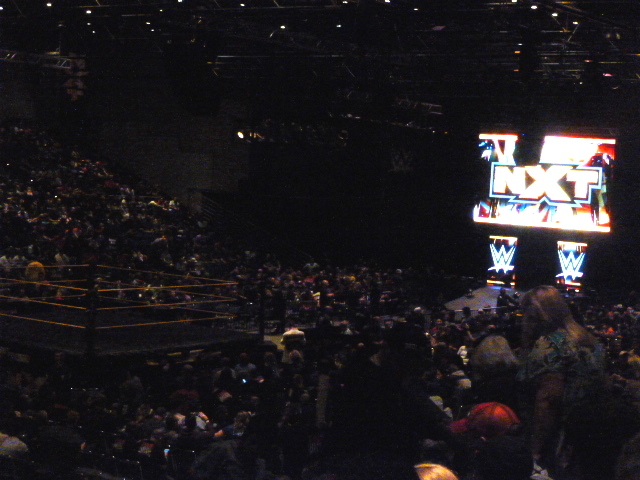 But even before that, The first note of Triple H’s theme, “Play the Game” played while we were outside at intermission. We scrambled like it was January 7, 2002. That’s how much Triple H means to NXT and the “Thank You, Hunter” chants he received emphasized that. This entry was posted in I Was There, NXT, WWE and tagged Adrian Neville, Aiden English, Alexa Bliss, Baron Corbin, Bayley, Becky Lynch, Buddy Murphy, Bull Dempsey, Carmella, Charlotte, Colin Cassady, Dana Brooke, Enzo Amore, Finn Balor, Hideo Itami, Jason Jordan, Kevin Owens, NXT, NXT Live, Rhyno, Sami Zayn, Sasha Banks, Simon Gotch, The Vaudevillians, Triple H, Tyler Breeze, Wesley Blake, Wrestlemania 31 Weekend, WWE. Bookmark the permalink.